Wedding venues offer the ideal setting for unforgettable memories for the bride, groom and all their guests. Make your Maine Wedding everything you ever dreamed and more, imagine the incredible background splash of the ocean, lakes, mountains, islands & lighthouses. Are you exploring Maine during a vacation or looking for a quiet, relaxing retreat on the beach or a nice quite Honeymoon? By opting for a B & B over other lodging can be a great way to personalize your stay. Maine is also filled with charming bakeries. Whatever the occasion, they have what your looking for. Wedding cakes, Anniversary cakes or just something special to take to a friends. Wedding cakes symbolize good luck. 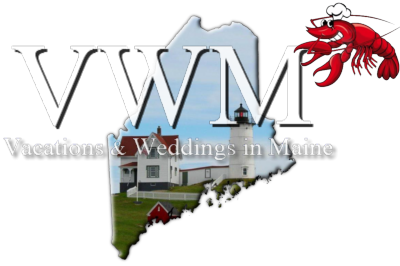 Looking for romantic wedding aboard one of our classic Maine Windjammers, Schooners or Catamarans? What a special way to celebrate an any special event? There's no better way to excite your guests than by having great entertainment. A band, DJ or singer can entertain during dinner or get your guests on the dance floor. No wedding is complete without decorative flowers to liven up the room. Having a Maine florist you'll see & smell the beautiful flowers throughout your venue. Getting ready for that big day? Working hard to stay healthy? Rehearsal dinner is a special celebration, a time for your closest friends and family. Find the venue for this intimate gathering of your closest friends and family, so you can celebrate the upcoming wedding. Maine offers a wide range of lodging options to suit your taste and budget. From private homes to cottage rentals, there are many accommodations to choose from including charming B & B's. Your guests will appreciate the luxury and convenience of valet parking for your wedding. With a limited parking availability at certain venues, this will save your quests time and hassle by catering to their needs. Looking for the most beautiful bridal dresses? Make sure your wedding dress is as perfect as you have always imagined. A wedding planner will help you with all the things that you need for that special day. Leave the stress of wedding planning to the professionals. Contact one of the Maine's expert planners and relax with the knowledge that your event will go off without a hitch. Let a professional help make a perfect day.